Rural Route 50�the John Mosby Highway-- is a significant, historic corridor, dating from the 1700�s when travelers on horseback, in wagons, and in carriages made the journey from Washington to Winchester. The small settlements along its path provided lodging and provisions for the travelers and commerce centers for farmers. During the Civil War, the John Mosby Highway served as a conduit for movement of troops and was the stage for bloody battles, cavalry skirmishes, cannon fire, and hospitals for the wounded. Many buildings � houses, shops, mills, and inns � are 18th and 19th century architecture still inhabited by families and prospering businesses. The villages are self-sustaining communities where people live and work, and where agriculture continues as the leading industry. The area is known for its abundant natural resources � wildlife, stream valleys, mountains � and its rich cultural heritage. Visitors come here from all over the U.S. and other countries to enjoy the unspoiled beauty of the Virginia Piedmont. Citizens formed the Coalition in 1995 to preserve and enhance the scenic, historic countryside bounding a 20-mile stretch of rural Route 50 from Lenah to Paris, including Aldie, Middleburg, and Upperville. Their purpose was to find an alternative to expanding the road into a multi-lane divided highway with bypasses around the towns. The Coalition�s solution is a traffic-calming plan designed to cope with road safety issues and community concerns without restricting the movement of traffic. Traffic calming uses subtle road design changes so that motorists will drive the desired speed. These changes not only increase safety for motorists and pedestrians but also enhance the community and its functions. The original grass-roots group has been joined by hundreds of citizens and other organizations throughout the region and elsewhere. Funds to carry out the Coalition�s work have come from individual contributions, large and small, and from foundations. 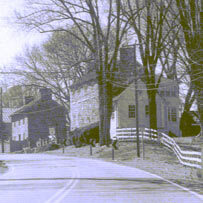 As part of the process of producing the traffic-calming plan, the citizens defined a vision of the Route 50 Corridor as: �a scenic, unique, rural community in an historical, agricultural, quiet and natural setting�. This vision statement was developed as a means to guide and assess land-use planning and transportation decisions for the corridor. The Blue Ridge landscape, the peaceful country roads, antique shops, inns, and farms surrounding the John Mosby Highway offer unique touring experiences, including stable tours, wine festivals, and garden tours. The villages and farms survive economically because the main travelway passes through the towns, keeping the center alive and the adjacent farmland unharmed. The Route 50 Corridor Coalition�s goal is to participate in community initiatives to preserve the area�s heritage and to further the vision of the citizens. About the Coalition | What is Traffic Calming?